The more popular says that “during times ancient China there was a huge deluge: the people offered sacrifices to the god of one of the flooding rivers, the Luo river (洛河), to try to calm his anger. A magical turtle emerged from the water with the curious and decidedly unnatural (for a turtle shell) Lo Shu pattern on its shell: circular dots giving unary (base 1) representations of the integers one through nine are arranged in a three-by-three grid.” Something along this line but different versions of presenting it. The Lo Shu was the key to the flying star pattern which not many outsiders knew how the flying star was supposed to come about until Shen Zhu Ren wrote about it after reading the secret book of Wu Chang by lineage holder then, Zhang Zhong San. The Lo Shu numbers are said to be magical numbers in the way they are arranged. If you look that how the numbers are arranged, no matter which direction you add them up, they will end up the sum of 15. Don’t believe, try add them up. It is also from this 9 square of the Lo Shu that some Feng Shui Masters adopted the 9 grid system of dividing the house to practice Feng Shui. So much for some masters telling you stories about dragon tortoise with numbers on the back. 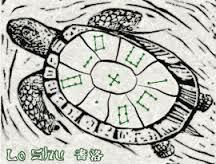 I tell you the truth in Real Feng Shui…It was just an engraving found on a turtle shell!. But I guess people like to listen or believe in mystical stories right?. It gives them the feeling that they are really in the mystical world for FENG SHUI! Read on by clicking the links. Previous postForms and Formula…Which is What?